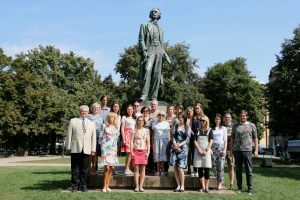 The 61st session of the Summer School of Slavonic Studies (the LŠSS) held under the auspices of the Rector of Charles University prof. MUDr. Tomáš Zima, DrSc., MBA is designed for the specialists of the Slavic and Bohemistic field, postgraduate and undergraduate students, translators and for everybody, who is interested in the Czech language, literature, history and culture. In addition to a survey of contemporary research in Czech language and literature and Czech history, it provides many cultural opportunities. A wide range of instruction, including practical language courses, optional seminars and specialized lectures, will be offered by teaching staff from Charles University and from research institutes of the Czech Academy of Science. The Executive Committee of the LŠSS will ensure the academic standard and content of courses given at the School. The LŠSS starts on Friday 28 July 2017. The official opening ceremony /and placement test/ is scheduled for Saturday 29 July. Classes begin on Monday 31 July, and end on Thursday 24 August. The closing ceremony will take place in the afternoonon on Thursday 24 August. The day of departure is Friday 25 August 2017.